Pervasive offers a range of products for secure data management led by oor leading product: Pervasive PSQL v11. We also have a number of related products that provide value to customers in monitoring, backup and other data control and maintenance functions. 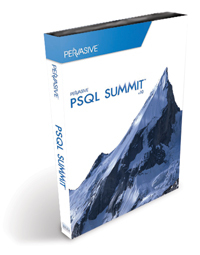 Pervasive PSQL is a powerful, embeddable, low TCO database engine featuring navigational access through the Btrieve API. Pervasive.SQL is recommended for embedded use within SMB-targeted business applications. Pervasive AuditMaster™ - monitors and reports all activity occurring in a Pervasive PSQL database. With the ability to be plugged directly into the Pervasive SQL database engine, it has audit functionality that can be added without coding. Customers use AuditMaster to ensure regulatory compliance, to avoid fraud and to diagnose data-related problems. Pervasive DataExchange™ - replicates data in real-time between Pervasive PSQL databases and supports multiple replication network topologies like point-to-point and peer-to-peer. DataExchange can be used with applications maintaining a warm backup, loading a reporting server, sharing data among multiple offices and connecting remote users. Pervasive Backup Agent™ - helps backup operating databases by allowing applications to stay in production during backups. The agent intelligently ensures data files are clean and consistent for safe backup to tape, disk or other media. A complement to 3rd party backup packages, it can be integrated into existing backup processes.